Microscopic Simulation (MS) uses a computer to represent and keep track of individual ("microscopic") elements in order to investigate complex systems which are analytically intractable. A methodology that was developed to solve physics problems, MS has been used to study the relation between microscopic behavior and macroscopic phenomena in systems ranging from those of atomic particles, to cars, animals, and even humans. In finance, MS can help explain, among other things, the effects of various elements of investor behavior on market dynamics and asset pricing. It is these issues in particular, and the value of an MS approach to finance in general, that are the subjects of this book. The authors not only put their work in perspective by surveying traditional economic analyses of investor behavior, but they also briefly examine the use of MS in fields other than finance. Most models in economics and finance assume that investors are rational. However, experimental studies reveal systematic deviations from rational behavior. How can we determine the effect of investors' deviations from rational behavior on asset prices and market dynamics? 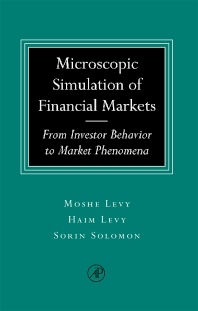 By using Microscopic Simulation, a methodology originally developed by physicists for the investigation of complex systems, the authors are able to relax classical assumptions about investor behavior and to model it as empirically and experimentally observed. This rounded and judicious introduction to the application of MS in finance and economics reveals that many of the empirically-observed "puzzles" in finance can be explained by investors' quasi-rationality. Researchers use the book because it models heterogeneous investors, a group that has proven difficult to model. Being able to predict how people will invest and setting asset prices accordingly is inherently appealing, and the combination of computing power and statistical mechanics in this book makes such modeling possible. Because many finance researchers have backgrounds in physics, the material here is accessible. Haim Levy is a Miles Robinson Professor of Business Administration at The Hebrew University, Jerusalem. Ranked as the most frequently cited author in finance, he has written on financial management, business statistics, portfolio and investment selection, decision-making under uncertainty, investments, and many other subjects. Moshe Levy, a Lecturer at The Hebrew University's School of Business Adminstration, has a background in physics, and employed MS techniques to investigate complex economic and financial systems for his Ph.D. work. Sorin Solomon is a Professor of Theoretical Physics at the Racah Institute of Physics, The Hebrew University, Jerusalem. Winner of the Levinson and J.F. Kennedy prizes for scientific research, he frequently writes on finance.